I love Benzon’s photos of pond scum, especially because many of them feature manmade objects amidst the polluted water, which creates an interesting tension between the living and the dead. The juxtaposition of “nature” and “industry” also appeals to me. Bio and synthetic. Both are contagions. Neither are innocuous. Alone they seem dormant, put together they seem toxic. Or at any rate, they seem removed from humanity, forgotten, neglected, afloat in their own private universe. I’m beginning to think of “the avant-garde” synonymously: both living and dead: undead. Or more precisely, not-human, inhuman, unhuman, or as a kind of desire to dehumanize. Conversation is cracking over at Montevidayo lately on the topic of “the avant-garde.” I tried to join in by offering some preliminary ideas about the connection between the avant-garde and dehumanization. But then other obligations got the best of me and I fell out of the conversation. Then, in the comment section of an interview I did with Noah Cicero over at WWAATD, I responded to questions by Stephen Tully Dierks and tried to extend some of these ideas by showing their application via specific literary texts (Beckett, Barnes, and Burroughs). All of this to say, I figured maybe I’d do a thinking-out-loud post here on the topic. On one level this seems right to me, but it also seems problematic in the way it relies on “unfamiliarity.” How exactly do we calculate unfamiliarity? As artists, wouldn’t we need to have a complete comprehension of all previous works created in order to produce something unfamiliar? And from the reader’s perspective, what is familiar and unfamiliar would depend on exposure. Isn’t it more precisely the act of defamiliarizing understanding or experience that we should consider the experimental impulse? Understanding and experience, of course, directly relate to being human. Whereas concrete literature (or) realistic or naturalistic literature (or) representational literature seeks a connection with humanity, with the human experience; experimental literature, perhaps more accurately described as abstract literature, resists connecting with humanity, resists mimesis. The desiring machine of abstract literature moves away from the clarity of realism, toward the opacity of the unknown. 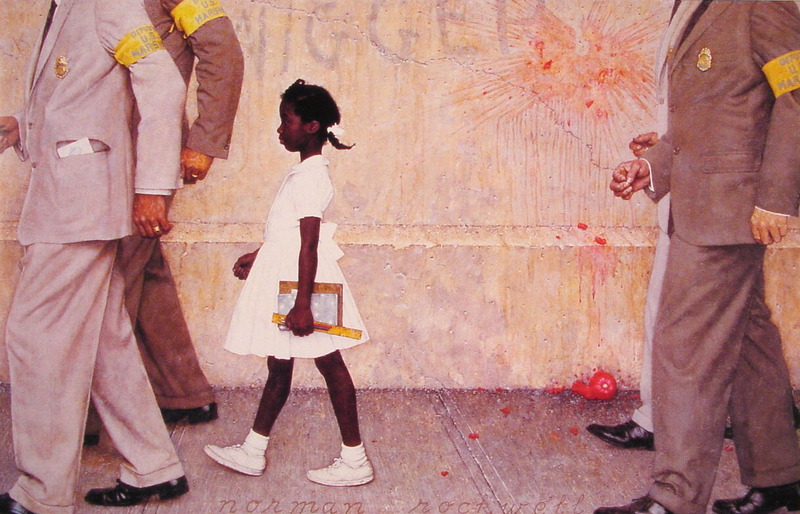 The Rockwell moves toward understanding and experience, toward humanity. The Stella moves away from understanding and experience, toward inhumanity. In a way, I think this echoes my attempt at explaining experimental literature in terms of Hejinian’s opened and closed model. I’m currently reading Marjorie Perloff’s The Poetics of Indeterminacy, which opens with a comparison of Ashbery’s poem “These Lacustrine Cities” and Eliot’s “The Wasteland.” Through the comparison she shows how “The Wasteland” corresponds to (i.e. represents) a real London, whereas “These Lacustrine Cities” has no referent because it is imaginary and therefore is indeterminate. I’m not finished with the book yet, but even in this opening example it seems like Perloff is describing the difference between a closed text (“The Wasteland”) and an open text (“These Lacustrine Cities”). Bringing this back to my current ideas, I’d offer that “the Wasteland” is an example of a human text, an attempt at becoming more human; whereas “These Lacustrine Cities” is an example of a dehumanized text, an attempt to become less human. If not human, than what? Monstrous? I have a lot more to say about that idea, but not now. I could easily get carried away in this post, offer a bazillion examples and quotes, but I will resist and say this is the trajectory of my current thinking, which I’m attempting to puzzle out as a potential dissertation prospectus. I’m keeping notes here, if you’re interested.